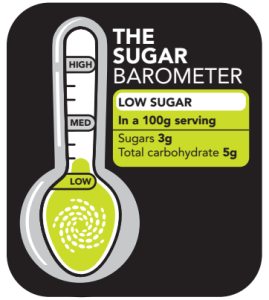 Eat Better South Africa, The Noakes Foundation’s educational arm, is excited to announce the release of The Sugar Barometer ™ – a labeling product that is set to change the sugar consumption landscape in South Africa and the world. The idea was borne off the back of the sugar tax debate and the discussion around whether such a strategy would realistically lead to a reduction in obesity rates. The Foundation realized that it’s not the cost of sugar that’s the problem, the real issue boils down to the fact that most people are unaware of the hidden sugar contents in food and are still unsure of how to read food labels. This lead us to ask the question of how we can educate all South African’s, most importantly the poorest and youngest, about the dangers of too much hidden sugar in the diet. Sugar goes by a number of aliases and it is becoming increasingly difficult to discern the exact nutritional contents of the food we are eating amongst the confusing variety of scientific names. A clear and simple way to indicate sugar levels, whether high medium or low, on the front of packaging is desperately needed – something children and illiterate people can see and understand at a glance. We did some research into commonly eaten foods and were shocked to learn of the amount of hidden sugar, from sauces to sandwiches to cereals, each had teaspoons of the sugary substance that is contributing to the country’s ever increasing obesity and type 2 diabetes rates. The detrimental effects of sugar on the body are well documented – it can lead to increased blood pressure, weight gain, type 2 diabetes and can cause a whole host of metabolic dysfunctions that fuel chronic disease. Possibly one of the most severe effects of eating too much sugar is its potential to wreak havoc on your liver, overloading and damaging it, leading to a condition known as non-alcoholic fatty liver disease, a condition similar to the effects of years of alcohol abuse. Last week in Professor Noakes’s presentation to a number of GP’s from around South Africa, he highlighted the body’s sensitivity to sugar: “The body needs 5 grams of sugar in total in the blood at any given time, this is the equivalent of two small mints, and anything more leaves the body in a state of emergency working to metabolize the extra sugar.” Years of putting the body under this stress due to sugar abuse can damage the body’s ability to metabolize sugar properly, leading to serious metabolic dysfunctions. The Sugar Barometer ™ is a simple label that clearly indicates the sugar and carb content of the food item – the purpose is for children and illiterate people to be able to identify the number of teaspoons of sugar a product contains, equipping them to make an educated decision on whether to purchase the item or not. “The focus has to be on education not mere taxation and revenue generation. Whilst imposing a beverage sugar tax is a progressive move by government and the strategy supports the dramatic need for something to be done about the escalating diabetes and obesity crisis in South Africa and around the globe, it’s not yet clear enough whether this money will be put back into better nutritional education and awareness. The Sugar Tax certainly may have some short term benefits on consumption levels of sugared beverages like we have seen in other countries that use this taxation approach, but there are some obvious caveats that risk it possibly ending up making the poorer worse off. Even making seemingly healthy choices for oneself and one’s children doesn’t always work – there is almost always sugar added to the majority of packaged products we find in supermarkets. Sugar is hidden everywhere and is our number one public health enemy. One further problem with the sugar tax is that it’s only on some sweet beverages not others. Its also not to be imposed on added hidden sugars in foods and snacks which will not necessarily stop or fix the issue in the medium to long term or rectify our notorious place as the third most obese country in the world. A lot more needs to be done, fast. 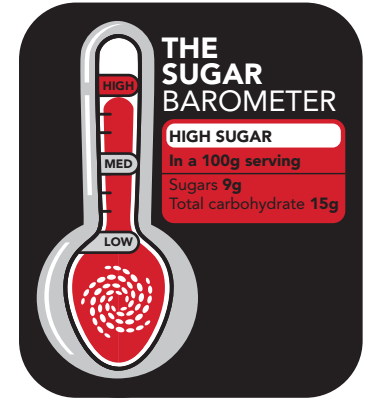 We suggest a far more progressive approach would be the mandated addition of the Sugar Barometer ™ onto the front of packaging of all food and beverages coupled with a very clear tax incentive. Those that honestly and openly disclose the sugar content of their food should pay less sugar tax and be commended – food, beverage and retailers alike. 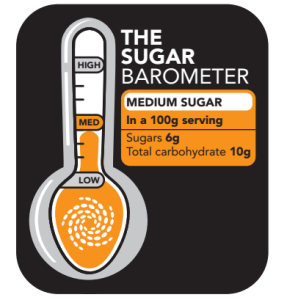 The Sugar Barometer ™ educates and warns consumers clearly of what is in the food they are eating and can be easily understood by anyone of any age, literacy, language and culture. We have tested it on children and people around South Africa and have found a universally understandable concept. Unlike the usual traffic light systems that have been developed in Europe, this is a simple ‘how much sugar is in here’ label that comes with no good bad or ugly warning light attached to it, despite our core premise being that people cut down on their total daily sugar and carb consumptions as a means to improve health”. The Noakes Foundation and particularly Eat Better South Africa want to challenge government, retail and individual manufacturers to include the Sugar Barometer ™ on all food and beverage products and suggest that there is a clear reduction on the sugar tax for those products that are open and honest about their sugar content. If you are honest about the sugar in your product, no need to be penalised. We believe in empowering every South African to empower themselves in their decision to cut back on sugar, or at least be aware of how much they are consuming.